I added four new purses to the Pesky Cat Designs shop today. More to come next week! 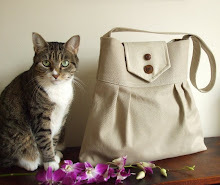 Two new bag designs are now in the Pesky Cat Designs shop! The Carryallposted above is made from a Harris Tweed wool in one of my favorite plaid weaves. It has a total of four pockets that includes a handy exterior back pocket for things such as a cell phone. 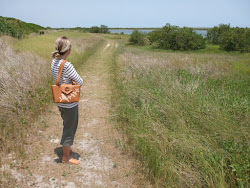 I also created a smaller shoulder bag in a similar design with a rounded flap closure. The photo shoot took place in Stuyvesant Square, NYC, located only a few blocks away from where I live. On warmers days I like to get a cup of tea or coffee and sit in the park watching the squirrels and birds. Today it was just photo taking and back to the studio! Yesterday I decided it was time to take some model shoots of my Harris Tweed Messenger/Shoulder Bag so I threw on my warm faux suede coat and some comfortable boots and headed over to the Gramercy neighborhood of NYC. That's me standing on the corner of 19th street and Irving Place. I also took a photo of my Offbeat Messenger being worn as a shoulder bag in front of Gramercy Park, a small fenced-in private park located in the Gramercy neighborhood of NYC. It is privately owned by the owners of the surrounding structures and residents living in these buildings that face the park may buy a key to the park. It's obvious that I did not have a key but managed to get a nice shoot nontheless.